Looking for a fun way to celebrate Cinco de Mayo and avoid spending a small fortune eating out? Gather everyone in the kitchen and get the fiesta started making Family Style Chicken Tostadas! -The chicken is cooked using the Instant Pot ! I’ve also included other methods of cooking the chicken (in case you don’t have an Instant Pot) in the recipe notes. If you have an Instant Pot, you are going to love this recipe! I threw the chicken into the Instant Pot COMPLETELY FROZEN, set the timer for 12 minutes, let the pot naturally release the pressure and just like that, fork tender chicken. Unbelievable. Complete instructions on how to cook frozen chicken in the IP on this post. If you don’t have the IP yet, you need to get one, I promise it’s the best $78.27 you’ll ever spend. Take a look at this post if you’re still wondering why you need the Instant Pot, and for links to some of our favorite Instant Pot recipes. -Everyone in the family will love this recipe – it can be made without meat for vegetarians in your home. Gluten free? Family Style Chicken Tostadas are made with mini corn tortillas! Make sure to read labels when choosing the beans for the refried bean portion of the meal. If your people aren’t tostada fans, they can create a salad and top it with guac. No one will be reaching for cereal during this meal. 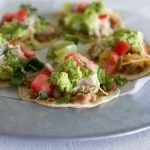 -Family Style Chicken Tostadas is a recipe everyone can get involved and help prepare. Even the littles can grate cheese, wash the veggies and tear the cilantro off of the stems. If you’re going it alone, it will take a few extra minutes to chop and prepare everything needed for this meal, but no more than about 20 minutes. I prepare the chopped portion of the meal while the chicken and beans are cooking! -When you cook a meal together as a family, you also create a memory! This has been my mantra, motto, tag line forever. It’s true. My kids will tell you over and over again about their best memories in the kitchen, and the traditions we have created around cooking and food. If there is good food, people remember a good time. Turn the radio to your favorite Latino station or ask Alexa to play a Latin dinner party mix. Cook the chicken using IP, slow cooker, or oven. Start the beans on the stove. Gather family and friends, make guac, chop the veggies place in bowls or cups or arrange on a big cookie sheet or platter. Grill or fry the tortillas. Place the chicken in a large bowl. Spoon the beans into a bowl. Don’t forget the chips and salsa! Serve with a big pitcher of Fruit Filled Virgin Sangria or bottled Jarritos (found at most grocery stores in the ethnic food aisle). If using an Instant Pot, Place the frozen or thawed chicken breasts into the IP. Season generously with salt and pepper. Pour 1 cup of green chile salsa over the chicken. Place the lid on the pot, lock into place and set time for 12 minutes. When the timer goes off and the chicken is finished cooking, allow the pressure to release naturally for about 10-15 minutes, then remove lid. When the pressure has released, remove the lid and shred the chicken with two forks. Squeeze the juice of two fresh limes over the chicken and add about 1-2 tablespoons of honey to the chicken. Fold chicken gently with the liquid (including lime and honey) in the pot. Set aside and keep the chicken mixture warm until ready to serve. See recipe notes alternative cooking instructions for chicken. While chicken is cooking, make the refried beans. Place two tablespoons of olive oil into a saucepan over medium low heat. Add the garlic and cook for about 1 minute, be careful to not burn garlic. Add two cans of pinto beans, undrained, to the garlic mixture. Add chili powder, coriander, cumin salt and pepper to the beans. Mix well. Using a potato masher, smash the beans until fairly smooth while cooking. As the beans cook, they will thicken and will continue to thicken as they cool. Remove beans from heat, place in a bowl or keep warm until ready to serve. Prepare the remaining ingredients by chopping and placing in bowls. To make the guac, peel and smash the avocados and place in a bowl. Squeeze the juice of one lime over the avocados, add a bit of garlic salt and mash until desired consistency. Place in bowl. When ready to serve, arrange on a counter or table, turn on griddle and heat to 350 degrees. Spray griddle with cooking oil after griddle is heated and cook tortillas on each side for about 1-2 minutes. If you like your tortillas crispy, fry the tortillas in a little canola oil in a frying pan until golden, flip and cook on opposite side and drain on paper towels after removing from grease. Stack tortillas on a plate until ready to use. When ready to assemble, let each person make their own tostadas by spreading with beans, meat, and any other desired toppings. -If you do not have an Instant Pot, you may use a slow cooker. Place the chicken in the slow cooker fresh or frozen with about 2 cups of salsa. Season as directed. Cook on low for about 4 hours. When the chicken is done add the lime and honey as directed. Keep warm until ready to serve.-This recipe is easily adaptable to your like and dislikes. Add or omit any of the topping ingredients. If I double the recipe, do I need to adjust the IP time? Also, can I use a regular pressure cooker (not instand pot brand) and follow the same instructions? Thanks for all your great recipes. Haven’t found one I don’t LOVE. Thanks! If I double the recipe, do I need to adjust the cooking time in the IP? Also, can I use another brand of pressure cooker instead of the IP? Thanks for the great recipes. I haven’t tried a recipe that I don’t love! If you double the recipe, make sure you don’t fill the IP too full. For safety reasons, all grain and legume recipes (including their cooking liquid) should not fill your pressure cooker more than half-way; all other recipes no more than 2/3 full. I have only cooked using the Instant Pot. You may have to adjust the time with a different brand. Please let me know how you like the Tostadas! Do you add water to the IP or only the salsa? Melinda, you only need to add the salsa to the Instant Pot. Thanks for reading ABK! I am needing to switch things up for dinner time so I came to your website. I have heard amazing things. This was my first recipe to try. They were sooo good. We loved them. I just did the chicken in the crockpot and it was great! Thanks. Can’t wait to make more.